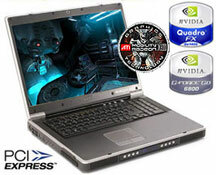 Eurocom Corporation, a leader in the Desktop Replacement notebook technology since 1989 has introduced the NVIDIA Quadro® FX Go1400 PCI Express card in D900T Phantom high-performance Mobile Workstation offering a choice of upgradeable video cards based on 16x PCI Express architecture with 256MB of DDR video memory. The new NVIDIA card resets the bar for mobile workstation graphics, providing the performance, programmability, precision and quality CAD, DCC and scientific applications require. The NVIDIA Quadro FX Go mobile GPU provides a full complement of workstation features, including hardware-accelerated antialiased lines, OpenGL hardware overlay planes, and two-sided lighting, providing extraordinary application performance and a high level of quality. These features make the EUROCOM D900T Phantom an ideal solution for professional 2D and 3D designers, video, scientists, engineers, researchers and game developers.